Hi friends! I hope you are well! I'm not feeling so great. I was up from 4am-6am this morning coughing. I'm hoping that doesn't repeat tonight. I just wanted to share a super quick project that I made during teacher appreciation week LAST MONTH that I never posted to my blog. I wanted to do several days of small gifts and on the last day I gave the teachers some Starbucks gift cards. This was one of the small gifts. 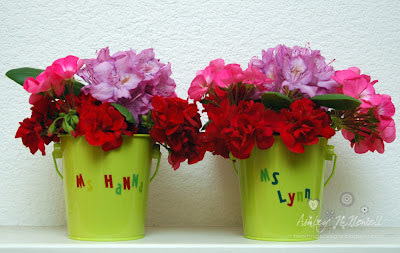 I took buckets from the dollar spot at Target and personalized them with stickers also found at the dollar spot at Target to create these cute custom buckets. Then Brady picked some flowers from our garden and I arranged them in here for him. I was thinking that these buckets would be great for things like storing pens, markers, paint brushes, etc... after the flowers died.